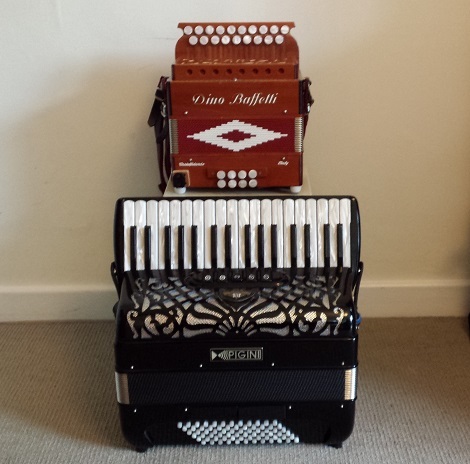 Given the name of the blog, it seems appropriate that an early article should look at how I, as a player of both accordion and melodeon, feel about them as related but quite different instruments. I have done this through the followings lists of “likes and limits”. I end the article by providing a number of twin recordings showing where they can both do the same job well. My accuracy on accordion is sometimes less than I would wish, and I tend to play looking at the keyboard (which I would prefer not to do, if only for appearances sake); I do not have this problem on melodeon. I find some tunes go better on accordion (eg Scottish reels) and some better on melodeon (eg polkas and hornpipes). But there is also a sizeable middle ground where they can both do a good job. To illustrate this I have compiled the following twin recordings. Lively jigs for English ceilidh dancing, played on melodeon and on accordion. These two continental Schottisches were penned by melodeon player Stony Steiner on his way to SKINT festival (of European music?). At the time I liked them so much I learned them on both accordion and melodeon (modified Castagnari Tommy) as shown below.